As agent and empresario of what became known as Robertson's Colony, Sterling Robertson organized Texas' second largest colony. Only that of Stephen Austin ranked larger in size. Robertson was born in Tennessee on October 2, 1785. He served in the war of 1812, and first came to Texas in 1823. Determined to start a colony in Texas, Robertson returned to Tennessee to implement his plan. Robertson purchased a colonization contract from Robert Leftwick, who had earlier negotiated the contract with the Mexican government to settle 800 families in Texas. The colony was located along the Brazos River northwest of the grant awarded to Moses and Stephen Austin. After trips to Saltillo, Monclova, and Mexico City, Robertson validated Leftwick's earlier contract, and began introducing families to the colony. The Robertson colony adjoined that of Stephen Austin. Because of an acrimonious dispute over Robertson's grant, the two men became bitter rivals. It was not until 1847 after both men had long since died, that the Texas legislature ruled on the disputed claim in favor of Robertson. Prior to the outset of the Texas revolution, Robertson had introduced into Texas more than 600 families. 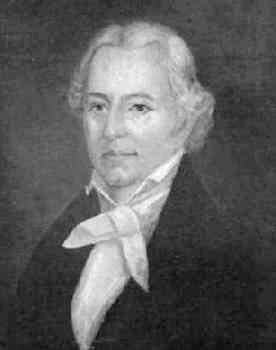 He was a member of the Convention of 1836 and as such, was one of the signers of the Texas Declaration of Independence. He commanded a company in the spring of 1836, and participated in the Battle of San Jacinto. He was a member of the senate in the first Congress of the Republic of Texas. Robertson died on March 4, 1842 at his home in Robertson County, named in his honor. His remains were removed in 1936 to the Texas State Cemetery in Austin.